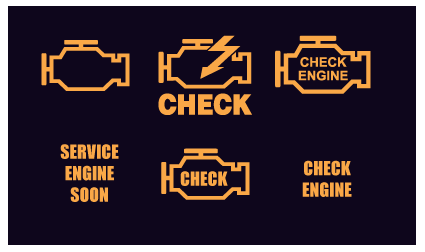 Your Check Engine Light Is On...Now What? Over 8% of drivers on the road today have a check engine light on. Unfortunately, the vast majority of those drivers won’t get it checked out for months. But hey, can you blame them? If everything seems fine, why waste a costly diagnostic to get it checked out? Or, perhaps there’s that desire to avoid the possibility of paying a lot of money to get it fixed? Well, it’s not always so easy to decide what to do. Let’s go through a common example. You’re on the highway, driving home from work and everything with your vehicle is ship shape. Then, your car beeps loudly, and your check engine light is on. Your first thought is probably, “oh no”, and your second is to look for or feel anything different in your car. This is a pretty good idea. See if your engine is overheating, feel if your car is driving strangely, or listen to anything different with the car. If you don’t notice anything out of the ordinary, drive it home. After you get it home, check some of the pieces of the vehicle that you can check on your own, like the gas cap being loose, any excess leaves or dirt under your hood, etc. If all of these seem fine, it’s probably a good idea to head to a mechanic to find the issue. Even a small $400 problem with the engine can potentially turn into a $7,000 engine rebuild if left unfixed. Granted, if you’re worried about what the problem might be, or wondering if it’s even worth getting looked at, you can always find an OBD-II diagnostic device that will let you know exactly what your check engine light means. For example,Mechanic Advisor has a device that immediately identifies what your check engine light is saying, and explains how serious it is. If it’s something that could destroy your engine, you’ll be told it’s severe. If it’s just something small wrong with your A/C, you’ll be told it’s a minor issue. The OBD-II diagnostic port was mandated by the U.S. government for all vehicles from 1996 and newer to keep emissions running at “normal levels”. While this does not guarantee that the reason behind your car’s issue pertains to emissions,those kinds of problems are quite common. So while your issue may not be harmful to your car, it could be harmful to the environment, and may result in an immediate failure during annual inspection. So while it might not be necessary to bring your vehicle into a mechanic right away, if you don’t know how serious it is, it’s better to be safe than sorry. Or, pick up an OBD-II reader to save a costly diagnostic and free you from all that worry.